If you skipped over Windows Vista like so many others have, you may be in for a shock when you upgrade from Windows XP to Windows 7. Microsoft’s newest operating system is a major shift in usability, convenience, and overall computing from previous versions of Windows. Although not all are earth-shattering changes, listed below are the Top 10 differences between Windows XP and Windows 7. Many of these changes may seem like a big deal because you’ve gotten so used to how things work in XP. If you are considering upgrading from XP to Windows 7, be prepared for these changes. Outlook Express (OE) has been a trusted friend since Windows 95, so much so that many people have never used another e-mail client. OE was removed from Windows Vista but was replaced with Windows Mail. Strangely, Windows does not ship with any email client at all. Users must either purchase an e-mail client such as Outlook, use a free service such as Windows Live Mail or Outlook.com, or download an open source email client such as Thunderbird. Although Windows XP did have a 64-bit version (Windows XP x64), many people are unaware that it even existed. When upgrading from XP to Windows 7, you will have to decide whether you want the 32-bit version (x86) or the 64-bit version (x64). Which you choose largely depends on your computer’s hardware and the availability of drivers and other software to make everything work in your PC. You can download the Windows 7 Upgrade Advisor tool from Microsoft, which will check your hardware and give you a recommendation on whether or not to upgrade. 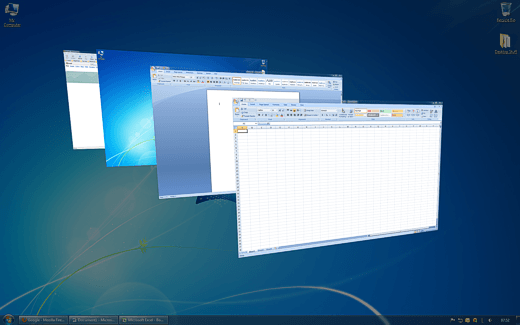 The Aero Desktop is really nothing more than a collection of window and desktop behaviors that make Windows 7 the prettiest version of the operating system to date. Features such as Aero Snap let you quickly organize open windows and transparency makes it easy to see what’s underneath other windows. With Windows XP, think opaque, with Windows 7, think translucent. The Documents and Settings folder, the location for all protected personal files and folders, has been replaced with a simple Users folders. Not a big deal, but many tech support personnel have spent hundreds of hours answering the simple question of where the Documents and Settings folder went in Windows 7. 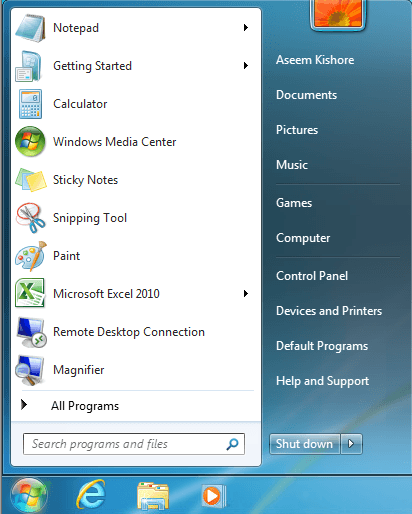 The Start menu in Windows 7 has been completely reworked and has been met with several criticisms. No longer does the Start menu use fly-outs and scroll-outs to show you what shortcuts to programs and folders you have on your computer. Now you must use a more conservative folder system that forces you to use a scroll bar to access shortcuts that can’t be displayed because you’ve reached the maximum number that can be shown at one time. However, if you really like the Windows XP Start menu, there are ways to make the Windows 7 Start menu behave like XP. Introduced in Office 2007, it is clear that Microsoft will continue to push the Ribbon interface over the more familiar drop-down menu and toolbar approach to using programs. If you want to get a taste of the Ribbon, start up Microsoft Paint or WordPad on a computer running Windows 7 and you can see for yourself whether the Ribbon is going to be useful or just another technology forced upon you. Windows 7 Libraries are nothing more than collections of files that are similar. Similar content that is located in multiple areas of your computer are brought together into the Library system to make finding files easier. Of course, you can choose to use or not use Libraries depending on whether you find them useful. However, if you store a lot of media on your computer such as music or video and you want access to them without having to physically move them the same location or folder, Libraries may be for you. If you are a gamer, you know that you must keep up with advances in both hardware and software technology to get the most from your games. Windows XP will not support DirectX versions beyond 9.0c, so if your games require a higher version such as 10 or 11, you have no choice but to move a more recent version of Windows. As more and more people make the switch to Windows 7, the game developers and publishers are likely to take full advantage of more recent DirectX versions. Stick with XP too long, and you may be shut out of the newest games. Whether you have a simple or complicated home network, you know that any help you can get to make administration easier is always welcomed. HomeGroup is a major shift in home networking simplicity that makes older paradigms seem archaic. Not much has changed in setting up a home network since Windows NT 4, an operating system from before Windows 95 that you may never have heard of. Marrying simplicity, easy setup, and stable connections, HomeGroup takes the guesswork and troubleshooting out of home networking on any scale. Although touch interfaces have been around for a better part of a decade, touch has not yet replaced the familiar keyboard/mouse combination of navigating personal computers. Still, Windows 7 is the first operating system from the software giant to natively support touch as a computer interface. If you think that you would like to be on the frontier of this emerging interface paradigm, Windows 7 is your only real choice if you want to run a Microsoft operating system. Some people have become so comfortable working with Windows XP that they have avoided upgrading to Microsoft’s newest operating system. The Windows Vista fiasco didn’t help matters, forcing some diehard fans of XP to downgrade to make their PCs functional again. If you are considering upgrading from Windows XP to Windows 7, be prepared for some new things, some missing things, and a few things in between. Also, read my post on which version of Windows 7 is right for you. Still, the stability and usability of Windows 7 has been more or less established, so you can rest assured that you are taking a step in the right direction by leaving XP behind. Enjoy!